"No messages bring me so much encouragement for the tasks ahead as the good wishes of my former students." 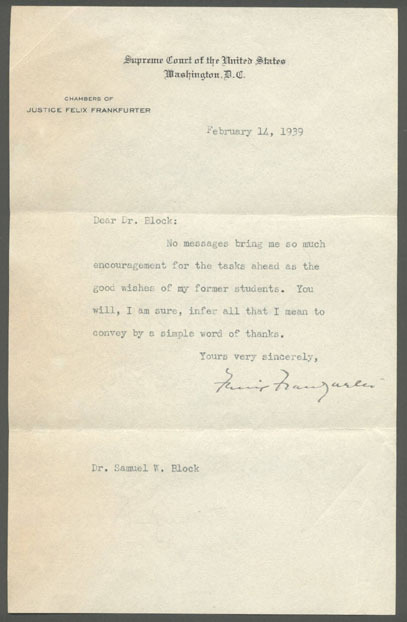 In this letter newly minted Supreme Court Justice Felix Frankfurter sends a letter to Dr. Samuel F. Block, a former student of his at Harvard Law School, thanking him for "so much encouragement for the tasks ahead." This was surely one of the first letters Frankfurter sent out on personalized Supreme Court stationary for he took the oath of office January 30, 1939 and this letter was penned a mere two weeks later on February 14, 1939. Frankfurter, a founding member of the ACLU and defender of Sacco and Vanzetti, was nominated by President Franklin Roosevelt on January 5, 1939 and quickly approved by the Senate on January 17, 1939. Current Senate Judiciary Committee Chairman Arlen Specter takes more time than that just to set a hearing schedule on Court nominees. While a renowned liberal, Frankfurter showed tremendous restraint and intellectual integrity by not legislating his own personal views from the bench. He became the court's most outspoken advocate of judicial restraint, the view that courts should not interpret the Constitution in such a way as to impose sharp limits upon the authority of the legislative and executive branches without clear language in the Constitution requiring such action. As we have seen with many justices since Frankfurter, the temptation to "interpret" the Constitution as upholding a justice's own political and social views is a temptation too hard for most to resist. Thus Frankfurter dissented from many of the Warren Court's decisions which manufactured a new constitutional jurisprudence not anchored in the words of the Constitution. That Frankfurter would have an historic feud with Warren Court liberal stalwart Justice William O. Douglas, he of the constitutional penumbras and emanations, was only proper. Besides being a letter very early in Justice Frankfurter's storied Supreme Court career, before he had written any decisions, it is also notable for its association with one of Frankfurter's well reported traits, his kind treatment of his former students. Throughout his long legal career he worked assiduously to place his former students and colleagues in prominent legal and government positions. Frankfurter networked long and hard before it was called that and in the process helped both himself and the American government he loved. A nice letter with a little age toning and a very clear signature at the very start of Frankfurter's distinguished Supreme Court service that recalls his traits as a good friend and mentor.